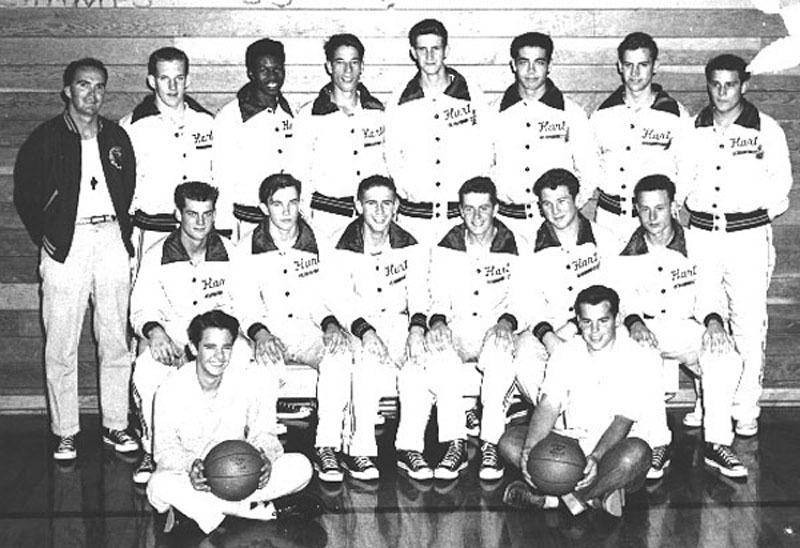 William S. Hart Junior & Senior High School, Varsity Basketball Team, Ventura League champions, 1954-55. Yearbook photo. Front, left to right: Harold Lackey, manager; Steve Garrett, assistant manager. Seated: Don Austin, Brian Hurt, Jim Gibson, Charley Johnson, Bob Harper, Bob Clark. Standing: Coach Bill Beeny, Bill Wertz, Hank Morgan, Bob Fisher, Ray Bond, Joe Kapp, Jim Fisher, Don Madrid. WR5502: 19200 dpi jpeg from smaller jpeg | Online image only.